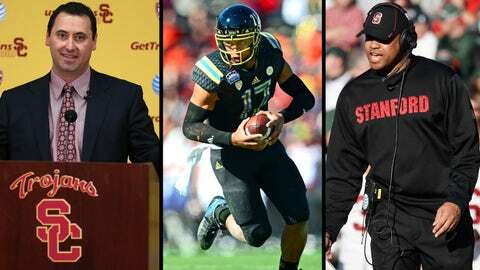 As college football opens spring practice, here are five key questions for the Pac-12. Will Sark be able to return USC to national prominence? USC was hit hard by players who decided to forego the rest of their eligibility and enter the NFL Draft. However, the Trojans do welcome a Top-10 recruiting class to a team coming off a 10-win season in 2013. Already hamstrung by numbers, the scholarships left behind by the underclassmen who decided to jump to the NFL were lost and could not be used on new signees. The good news is 2014 will be the final season of scholarship limitations for USC. Steve Sarkisian enters with new thoughts and ideas. At the forefront is not making a big deal out of what the Trojans don’t have, as in as many scholarships as the rest of the programs across the country. Also, the offense won’t look anything like USC has seen before. "Uptempo" is a word he uses to describe it but will it work with the USC fan base? Sarkisian received a vote of confidence from Pete Carroll to be the next USC head coach years ago when the current Seahawks coach was still in Cardinal and Gold. However, a dark cloud over Sark’s hiring is the fact that he won more than seven games in a season just once and he’s never won more than five conference games in a season. Those numbers won’t fly at USC. Is Brett Hundley a serious Heisman candidate? Brett Hundley’s not alone in the fact that some of his poorest performances came against Stanford and Oregon. His two worst performances from a passer-rating standpoint came against those two teams last season — four of his nine interceptions on the season were thrown against the Cardinal and the Ducks. Hundley turned the down the opportunity to be a first round pick in the NFL Draft for the opportunity to compete for a national championship. If the Bruins are going to reach such heights in the first year of the College Football Playoff, it’ll be Hundley carrying them there. If Hundley is going to do so, he’s going to have to get past Oregon or Stanford, but likely both. The good news is both of those teams have to make visits to the Rose Bowl in 2014. The bad news is Hundley is winless in three tries against the Cardinal and lost his only meeting with the Ducks. A win in the Sun Bowl doesn’t reek Heisman. An invitation to the Playoff, however, does. If that happens, wins over Oregon and/or Stanford would be in the rear view and Hundley can’t be denied an invitation to New York City for the Heisman Trophy presentation. Can Shaw keep the magic on The Farm alive? Jim Harbaugh won 29 games at Stanford in four seasons. David Shaw has won 34 games in three seasons. There’s no question, Harbaugh lifted the Stanford program out of the basement of college football but you can make the argument Shaw has elevated it to new heights with three BCS berths in three seasons under his watch. The Cardinal were a pick by some to win the national championship in 2013. In 2014, however, maybe the toughest challenge for Shaw, yet. The running joke about Stanford is "they’ll lineup and show you exactly what theyâre going to do." That’s a relentless ground game which at times features multiple tight ends and offensive linemen. The line will likely be anchored by Andrus Peat but five of the top six Cardinal offensive linemen from a year ago have to be replaced. Carrying the ball behind them was Tyler Gaffney but he’ll have to be replaced as well. Stanford’s leading returning rusher is quarterback Kevin Hogan, who gained 355 yards and two touchdowns on the ground last season. Barry Sanders Jr. is a name that’s going to garner a lot of attention but Remound Wright and Ricky Seale carried the ball more than Sanders did last season. Will Marcus Mariota be able to stay healthy? There may not be a more fun quarterback to watch in all of college football than Oregon’s Marcus Mariota. Mariota has changed the landscape of college football without even knowing it. The only school he wanted to go to out of Hawaii’s St. Louis High School was USC, but he never received an offer. Since then Trojans have had their struggles at the quarterback position. Mariota took his act to Oregon. Darron Thomas, Mariota’s predecessor, decided it’ll be a good decision to just leave school with no legitimate interest from the NFL than to return to Eugene and have to compete with the then-redshirt freshman for the Ducks starting quarterback job. Last season, Oregon’s streak of four consecutive BCS Bowl games was snapped, due in part to Mariota being a shell of himself playing with a partially torn MCL late in the season. The injury limited one of his most valuable assets in the Ducks offense — his ability to run. Mariota is another quarterback in the conference who turned down the lure of the NFL to return to school. Before the injury Mariota appeared to be headed towards the Heisman and the Ducks for a national championship appearance. Mariota never received an invite to New York and the Ducks settled for the Alamo Bowl. A healthy Mariota is, arguably, the best quarterback in the conference. Can Chris Petersen hang with the big boys? Houston Nutt. Dirk Koetter. Dan Hawkins. The trio of former Boise State head coaches all left the blue turf to take head coaching jobs at high major universities. While they all had success at Boise State, with the exception of Nutt — he went 4-7 in his lone season as Boise State’s head coach. However, none of them set the world on fire in their post-Boise State days. Nutt is the only one of the trio to have a winning record in his first season after leaving Boise. Next is Chris Petersen, who was named the head coach at Washington after Steve Sarkisian returned home to take over at USC. Will Petersen, at a high major conference school, be better or worse than the three previous former Boise State head coaches?